not to harm other people- "...It is not enough for us to say: "I love God," but I also have to love my neighbor. St. John says that you are a liar if you say you love God and you don't love your neighbor. How can you love God whom you do not see, if you do not love your neighbor whom you see, whom you touch, with whom you live? And so it is very important for us to realize that love, to be true, has to hurt. I must be willing to give whatever it takes not to harm other people and, in fact, to do good to them. This requires that I be willing to give until it hurts. Otherwise, there is no true love in me and I bring injustice, not peace, to those around me. It hurt Jesus to love us. We have been created in His image for greater things, to love and to be loved. We must "put on Christ" as Scripture tells us. And so, we have been created to love and to be loved, and God has become man to make it possible for us to love as He loved us. Jesus makes Himself the hungry one, the naked one, the homeless one, the unwanted one, and He says, "You did it to Me." On the last day He will say to those on His right, "Whatever you did to the least of these, you did to Me," and He will also say to those on His left, "Whatever you neglected to do for the least of these you neglected to do it for Me." When He was dying on the Cross, Jesus said, "I thirst." Jesus is thirsting for our love, and this is the thirst of everyone, poor and rich alike. We all thirst for the love of others, that they go out of their way to avoid harming us and to do good to us. This is the meaning of true love, to give until it hurts..." (Speech of Mother Teresa of Calcutta to the National Prayer Breakfast, Washington, DC, February 3, 1994). crisis of faith - Mother Teresa, who died in 1997 and was beatified in record time only six years later, felt abandoned by God from the very start of the work that made her a global figure, in her sandals and blue and white sari. The doubts persisted until her death. The nun’s crisis of faith was revealed four years ago by the Rev Brian Kolodiejchuk, the postutalor or advocate of her cause for sainthood, at the time of her beatification in October 2003. Now he has compiled a new edition of her letters, entitled Mother Teresa: Come be My Light, which reveals the full extent of her long “dark night of the soul”. “I am told God lives in me — and yet the reality of darkness and coldness and emptiness is so great that nothing touches my soul,” she wrote at one point. “I want God with all the power of my soul — and yet between us there is terrible separation.” On another occasion she wrote: “I feel just that terrible pain of loss, of God not wanting me, of God not being God, of God not really existing.” (Letters reveal Mother Teresa tormented by questions of faith). lepers - It wasn't until she had set up a leprosarium outside Calcutta on land provided by the government that I began to see her as an idealist rather than an eccentric. Lepers were a common sight all over India and in every part of Calcutta, but extending help beyond dropping a coin or two into their rag-wrapped stumps was not. As a child I was convinced even touching a spot a leper had rubbed against would lead to infection. The ultimate terror the city held had nothing to do with violence. It was fear of the Other, the poor, the dying--or to evoke a word with biblical authority--the pestilential. And so I could no longer be cynical about her motives. She wasn't just another Christian proselytizer. Her care of lepers changed the mind of many Calcuttans. Young physicians, one of them the uncle of a classmate, began to sign up as volunteers. It all made Mother Teresa seem less remote. The very people whom she had deserted when she broke with the Loreto nuns were now seeking her out (Mother Teresa: The Saint). 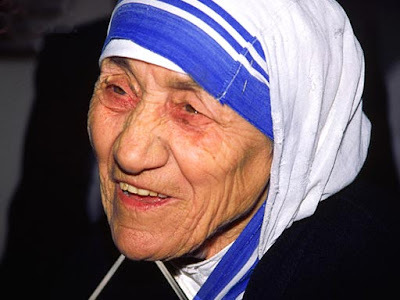 primitive fundamentalist - Mother Teresa is thoroughly saturated with a primitive fundamentalist religious worldview that sees pain, hardship, and suffering as ennobling experiences and a beautiful expression of affiliation with Jesus Christ and his ordeal on the cross. Hitchens reports that in a filmed interview Mother Teresa herself tells of a patient suffering unbearable pain from terminal cancer: "With a smile, Mother Teresa told the camera what she told the patient: 'You are suffering like Christ on the cross. So Jesus must be kissing you.'" Apparently unaware that the response of the sufferer was a put-down, she freely related it: "Then please tell him to stop kissing me." It should go without saying that a book review is always a mere skeleton, nothing more than a foretaste, of the book itself. There is much more in Hitchens' work, including some rather shocking details about her activities, not touched upon here. He shows her political wiliness, all but missed by her admirers who picture her as innocent of such matters; her stealthy baptism of dying nonChristians; her acceptance of money from unsavory characters and crooks; her activities as emissary of the pope; her partiality to -- or at least her lack of repulsion of -- dictators, even so horrible a character as Hoxha of Albania; her willingness to sacrifice the needs of the poor for the requirements of dogma; her enforcing of austerity in the midst of abundance; her dictatorial rule; her work being at bottom a fundamentalist religious campaign; and much more. And finally one can't resist mentioning her opposition to canning tomatoes for preserving for future use because there is absolutely no need to do so since God will provide (The Illusory Vs. The Real Mother Teresa). Mother Teresa (26 August 1910 – 5 September 1997), born Agnes Gonxha Bojaxhiu, was a Catholic nun of Albanian ethnicity and Indian citizenship, who founded the Missionaries of Charity in Calcutta, India in 1950. For over 45 years she ministered to the poor, sick, orphaned, and dying, while guiding the Missionaries of Charity's expansion, first throughout India and then in other countries. Following her death she was beatified by Pope John Paul II and given the title Blessed Teresa of Calcutta. By the 1970s, she was internationally famed as a humanitarian and advocate for the poor and helpless, due in part to a documentary and book Something Beautiful for God by Malcolm Muggeridge. She won the Nobel Peace Prize in 1979 and India's highest civilian honour, the Bharat Ratna, in 1980 for her humanitarian work. 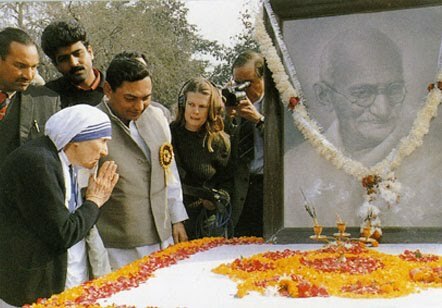 Mother Teresa's Missionaries of Charity continued to expand, and at the time of her death it was operating 610 missions in 123 countries, including hospices and homes for people with HIV/AIDS, leprosy and tuberculosis, soup kitchens, children's and family counselling programs, orphanages, and schools. She has been praised by many individuals, governments and organizations; however, she has also faced a diverse range of criticism. These include objections by various individuals and groups, including Christopher Hitchens, Michael Parenti, Aroup Chatterjee, Vishva Hindu Parishad, against the proselytizing focus of her work including a strong stance against contraception and abortion, a belief in the spiritual goodness of poverty and alleged baptisms of the dying. In 2010 on the 100th anniversary of her birth, she was honoured around the world, and her work praised by Indian President Pratibha Patil (Wikepedia).